The Mississippi Mystery » Mr. Dunn Goes to Montgomery | Who's Behind the Mask? This is the top of my Oct. 18, column, as it appeared on the “Y’all Politics” web-site. At some point in the not too distant future I will be writing more about the situation in Mississippi regarding the vastly over-budget and much-delayed “coal gasification” plant being built by Mississippi Power in Kemper County. It’s a fascinating business and environmental science story that has drawn the attention of national, even international media. 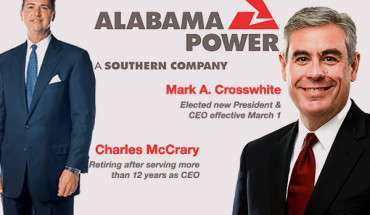 It’s also a juicy political story, with a host of players from, of all places, Montgomery, dispatched westward to assist Alabama Power’s sister company, Mississippi Power, with its Kemper debacle. To Mississippi went the “A team” — the two one-person non-profits, JobKeeper Alliance and PACE, and Alabama Power’s very own Dark Lord secret agent, Matrix LLC founder Joe Perkins. Their purpose: To oversee the political and public relations machinations for Mississippi Power, which is battling to win permission from that state’s PSC to make customers bear more of the burden for the budget-busting Kemper plant. Close followers of Mississippi politics are probably aware of a public relations war between two non-profits, one from your state, the other from Alabama, and regarding Mississippi Power’s Kemper coal plant. In one corner: JobKeeper Alliance, a Montgomery-based non-profit, and Patrick Cagle, it’s lone employee. In the other: Bigger Pie Forum, a Mississippi-based nonprofit devoted to pro-growth economic policy in Mississippi. I’m the “private detective” in the story. I will get there in a moment. Over the past two years, Bigger Pie and its volunteers have advocated the position that Mississippi Power customers should not have to bear any more of the financial burden of the budget-busting $5 billion Kemper plant and its experimental “coal gasification” technology. Somehow, speculation permitted, JobKeeper and a connected Alabama group, Partnership for Affordable Clean Energy (PACE), got wind of Bigger Pie’s activities and injected themselves into this Mississippi matter. JobKeeper has come at Bigger Pie with a multi-media onslaught, including but not limited to: large newspaper ads featuring a “smelly fish”; ads on talk radio and Facebook; mass emails to Mississippi’s elected leaders; numerous op-ed pieces by Cagle; even handbills and yard signs plastered throughout the Neshoba County Fair. The top of the “smelly fish” ad run by JobKeeper Alliance in Mississippi’s main newspapers. Cagle, incidentally, is the son of the long-time former head of security at Alabama Power. That company, like Mississippi Power, is a subsidiary of the Southern Company. JobKeeper has spilled a lot of ink and spent a small fortune on a matter related to Kemper while saying next to nothing about the plant itself. Rates have already been hiked 15 percent as a result of the $5 billion mess. Mississippi Power wants to increase them more, to 22 percent — and ultimately more than that, argue Bigger Pie and others. In August and again two weeks ago, Cagle penned op-eds in the Clarion-Ledger blasting away at Bigger Pie while skimming over Kemper. JobKeeper and PACE, going to bat for Alabama Power. PACE retained well-known and no doubt expensive Birmingham lawyer Mark White (at left) to participate in the Alabama Public Service Commission’s informal reviews of Alabama Power’s rates lat year at hearings dismissed by Terry Dunn as “Dog and Pony” shows. At right is JobKeeper’s Patrick Cagle. I realize this story would be more interesting if it involved breaking and entering, a hail of gunfire, even just one punch thrown. But alas, not. Here is the far duller truth. Bigger Pie did engage my services. They were concerned about the barrage of public accusations. They wanted to know who these people were. 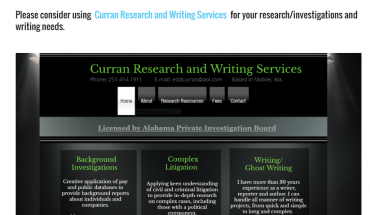 I’m a former investigative reporter from Mobile who wrote many stories on Alabama politics. I now operate a one-person legal research business. A pattern emerged early on — the targets of JobKeeper and PACE were people and organizations who posed a threat to the profits of Mississippi Power and Alabama Power. I decided to focus on Alabama, home of both non-profits. I learned that both groups have participated in a malicious, well orchestrated scheme to ruin Alabama Public Service Commissioner Terry Dunn’s political career by branding him as a left-wing environmentalist. He is no such thing. Dunn is a successful small businessman and three-time delegate to the Republican convention. More to the point: He is the first commissioner in 30 years to question Alabama Power’s industry-leading rate of return, or allowed profit. Dunn is also the first to seek the sort of rate hearings that are routine in other states, including Mississippi. The power company seems to control the state Republican Party, which is backing an opponent to Dunn in next year’s primary. In fact, your former governor is coming to Alabama in less than two weeks to hold a fund-raiser for Dunn’s opponent. That’s right: Haley Barbour, former chairman of the Republican National Committee, lobbyist for the Southern Company, and one of the most prolific fundraisers in American history — is heading up a fund-raiser to help defeat a Republican incumbent in a state public service commission race. Former Mississippi Governor Haley Barbour, back to wearing his Southern Company hat. Here, he’s addressing Rotarians in Pascacoula in October. At this and other appearances, Barbour touted Mississippi Power’s Kemper facility. Meanwhile, in Alabama, Barbour was helping raise money for Dunn’s opponent, Chip Beeker. Now, the “accosting” by the private eye. As part of my research, I went to JobKeeper’s office to review its tax return for 2012, the year of its formation. The returns of non-profits must be provided upon request. Before entering, I knocked on the door of the building in which Cagle has an office. The receptionist said Cagle was out. Unaware of his sensitivity to such things, I called him. He said JobKeeper’s return wasn’t yet available, due to an extension. He asked why I wanted to see it. Rather than lie, I told him I was working for Bigger Pie. I asked a couple of questions, such as about who funds JobKeeper. He replied, reasonably, that he would answer questions from a reporter but not from an investigator for Bigger Pie. I told him I understood but would be sending him some questions and intended to publish both the questions and responses on a website. He said he would review them and possibly respond. Here are two of the questions I posed to Cagle. Why did JobKeeper become involved in the situation in Mississippi regarding Mississippi Power’s Kemper plant? Would you deny that you have participated in public relations/political strategy sessions with employees and officers of Alabama Power (including Southern Company Services and Mississippi Power), as well as for consultants working on the company’s behalf? JobKeeper’s response was to issue the above described press release, ads, and letter to lawmakers. Bigger Pie did hire me. However, my findings regarding the Dunn situation alarmed me. I decided to pursue it as a journalistic effort. I have told Bigger Pie I will not accept payment from them. To do so would hurt the credibility of my hard work and my findings. I did not bill Bigger Pie, but they sent me a check anyway. I tore it up, though haven’t had the guts to tell my wife. JobKeeper and PACE can preach holier than thou about jobs. But boil them down to their essence, and what they really stand for is destroying the reputations of anyone who dares object to efforts by Mississippi Power and Alabama Power to have their way at their respective public service commissions. These heavily, if mysteriously, funded one-person associations (PACE doesn’t even have an office) injected themselves into the Mississippi debate for one reason: To attack Bigger Pie for urging the PSC to reject Mississippi Power’s request to unload more of its Kemper overcharges on some 186,000 mostly coastal residents and small businesses. In Alabama, the real purpose of the effort to destroy Dunn politically is to ensure that Alabama Power’s profit margins remain sky high by removing the greatest threat to the 30-year status quo. If you don’t believe that’s what this pair really stands for, contact them. Ask JobKeeper’s Cagle and Lance Brown of PACE to provide their positions on Mississippi Power’s rate increase request. Ask them if Alabama Power’s rate of return should be reduced to national norms, or even halfway down to the norms. Ask them if they’ve ever participated in public relations/political strategy sessions with employees and officers of Mississippi Power, Alabama Power, the related Southern Company Services, as well as for lobbyists, consultants or lawyers working for any companies or entities in the Southern Company family. For that matter, ask the above named power companies the same question, but regarding JobKeeper and PACE. Cagle can be reached at patrick@jobkeeperalliance.org and (334) 354-0107. Lance Brown of PACE can be reached at lance@energyfairness.org and (334) 294-9673. I’d love to hear what they say, or for that matter, any tales of involvement in the Kemper situation involving one of Alabama’s best known political consultants, Mr. Joe Perkins. I can be reached at eddcurran@aol.com and (251) 454-1911. Alabama Power’s very own secret agent, Joe Perkins, has played an important but as always way behind the scenes role in the political and public relations machinations on behalf of Mississippi Power as the company seeks permission from that state’s PSC to make customers bear more of a burden for the budget-busting Kemper plant. My one regret is that he didn’t identify those who were “affiliated” with JobKeeper. It would have been nice to have him admitting such affiliations in his own words.